In Peril on the Sea is the story of missionary widow Ethel Bell and her children-Mary, 14, and Robert, 11-uprooted by the war from their West African station, find themselves on a small freighter bound for America. It is 1942. Sights and sounds of war envelop the world. And in the arena of the South Atlantic the infamous German submarine U-66 prowls the gray waters. Suddenly, on a peaceful August afternoon, a shrieking alarm pierces the stillness. Torpedoes explode. Fire engulfs the ship and within two minutes it disappears beneath the oil-slimed, shark infested waters. What follows is an almost unbelievable saga of death and despair as mother, daughter and son find themselves on an eight-by-ten foot raft along with two orphaned missionary children and fourteen male crew members. 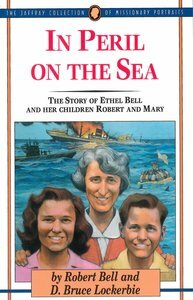 For twenty days aboard the bobbing vessel, Ethel Bell becomes pastor, peacekeeper, teacher, mediator and caregiver. But the story does not end with the surprising rescue. Years later, in a poignant moment, Robert Bell meets his "enemies" face to face. The war is over. God's love and forgiveness have triumphed. About "In Peril on the Sea"
Lockerbie served 35 years in teaching and administration at the Stony Brook School in New York and is chairman/CEO of PAIDEIA, Inc.